The question might have triggered a long discussion, had we not just left my house. I changed the subject instead. Years later, I think I’ve worked out a credible response. It’s partly about scale. The scales at which people see gardens and ecosystems. Take grasslands for example. Close your eyes and picture a native grassland. Stop reading. Close your eyes and picture an iconic native grassland. What do you see? Did you imagine a panorama of treeless plains and rolling hills, as in Eugene von Guérard’s painting of Bushy Park above? Or a reserve or small remnant, with edges, signage, tracks and interior? Or perhaps a close-up of flowers, grasses, stones and small animals? At which scale did the grassland pop into your head: the landscape scale, the patch (or reserve) scale or the plant scale? Ecologists study grasslands at all scales, but we don’t focus on all scales when we spruik grasslands to the public. It’s easy to investigate how botanists do sell grasslands to the public; by examining the photographs in field guides, articles and extension booklets. A picture is worth a thousand words, so the number of photographs at each scale must indicate the importance of each scale to the authors, yes? 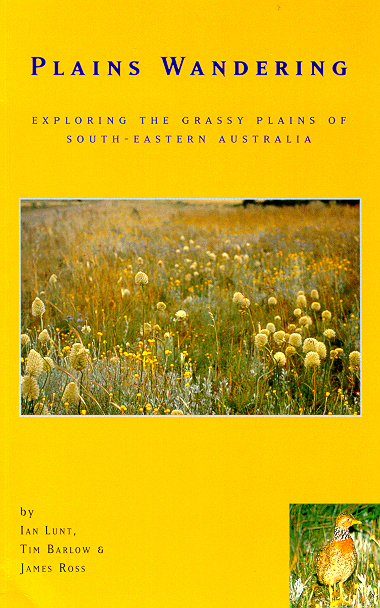 I stacked up all my books and pamphlets about native grasslands in south-east Australia, got myself a coffee, and spent a leisurely hour gazing at beautiful pictures. My first impression is that there is a big difference between what authors say in words and what they show in pictures. All the books say that native grasslands are rare, threatened and restricted to small remnants, especially in near-urban areas. But the pictures tell a different story. It’s customary to start big, at the landscape scale, with breathtaking photographs or historical paintings. Detailed maps complete the landscape vision, showing precisely where the grasslands do (or did) occur. From the landscape scale, the photos in most of our grassland books skip past the patch scale and dive to the plant scale; to colorful orchids, daisies, lilies and peas, the angular seed heads of native grasses. Many of these plants were photographed in small remnants, but the remnants themselves are usually obscured, hidden by low camera angles. My grassland books showcase a landscape without remnants (the historical vision) and wondrous plants in remnants, but rarely show the remnants themselves. The photographic evidence suggests that grassland aficionados don’t see reserves, patches or remnants as being particularly attractive, inviting or important. Plains Wandering: a field guide without remnants. Take Plains Wandering for example; a book I co-wrote, so can offend only my co-authors in critiquing it. We begin at the landscape scale, with historical paintings, sketches and maps. We stay at that scale with dozens of photos of beautiful grasslands and woodlands; all sweeping views or fields of colorful wildflowers. We then dive from the landscape scale to the small scale, with close-ups of iconic plants and animals. The core of the field guide follows, with photos of hundreds of plant species. In selecting our photos, we purposefully magnify the landscape and the plant scale, and unintentionally obscure the reality of an endangered ecosystem. The reality of remnants, patches, edges, fences, borders and neighbors. In retrospect, I wonder – where is the point of recognition, of contact or engagement, between this idealized ecological view, and the view of a homeowner with a patch of long grass behind the fence? For the uninitiated, the point of contact with an isolated remnant is the patch, not the landscape or plant scale. The scale we ignored. I guess this is why my friend thinks botanists have such terrible gardens. Like smokers, we shun the packaging and see only the goodies within. 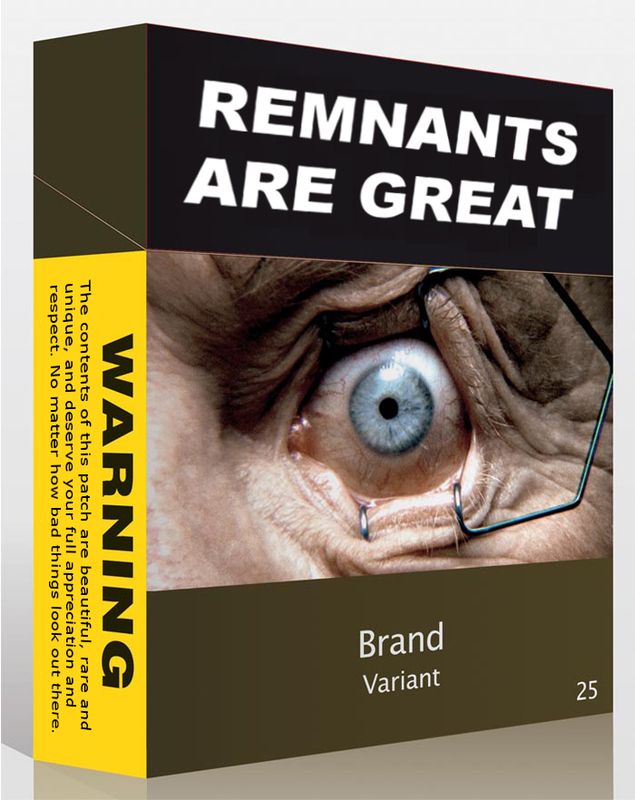 How do we sell our vision to a public who see only the unadorned plain packaging? Nearly 20 years ago, Joan Nassauer, a professor of landscape architecture in the USA, wrote a short, highly readable paper called Messy Ecosystems, Orderly Frames. This influential article was studied by landscape design students but was rarely read by ecologists. Nassauer made the following points. In urban areas, remnant vegetation will be accepted by the public if it looks attractive. Aesthetic values are influenced by culture, and don’t always correspond with ecological values. Many ‘attractive’ places have little ecological value, and many places of high ecological value are unattractive by conventional standards. Nothing surprising there. Can you believe the text? The patch view is a killer, regardless of the contents. (Original photo: DH&A). We can give our remnants a make-over in either of two ways; we can argue for the beauty within or air-brush the beauty without. Ecologists usually rely on the first approach and plead, ‘it may look a bit tatty but it’s really really rare and important, so please look after it’. Nassauer promotes the second approach; let’s gift-wrap our remnants in an attractive package. Her argument is that the packaging – more than the contents – signifies that the patch belongs in, and is valued by, our society. Orderly frames make ‘messy ecosystems’ socially acceptable. We all know that packaging is important. Cigarettes are one of the most addictive drugs on the planet; so addictive that their makers shouldn’t give a toss what’s on the box. Yet cigarette companies fight tooth and nail to stop legislation for plain packaging. If packaging can promote the sale of addictive drugs, we can use it to promote things that most people are not addicted to, or even attracted to. Like remnant vegetation. The world of art epitomizes the importance of framing. Framing tells us which artworks are most important. Not just the literal wooden frame, but the fact that an artwork is bought and sold at an auction house, hung and labelled in a gallery, interpreted by a program, guarded by a security system. Take away that social frame and it’s just another picture, of unknown value. Joan Nassauer argued that the best frames are those that reveal human intention, and signify that a patch is being cared for. She used the term ‘cues to care’ to refer to design features that show that patches are valued by people. Cues to care include the quality of fencing, whether edges are mown and maintained, the presence of paths, seats and other signs of human intent. Most people view remnants from a distant road, house or footpath, so many cues to care are on the edges. Remnants – or more importantly, the cultural frames around remnants – have to look good from the outside in. This stuff is old hat for green planners. But many remnants are cared for by people with backgrounds in ecology, not design, and ecologists traditionally argue (and demonstrate by our dress-sense) that knowledge beats presentation. In reality, we need both. A small sign of intention to care. If framing is so important, then why are photos of well-presented patches (or any patches for that matter) so rare in my grassland books? Why did we ecologists focus on landscape and plant scales, and avoid the framed patch, the packaged remnant? In defence of the books on my desk, there weren’t many reserves when the first books were written. Most patches had a tenuous future, sagging fences, and the most common form of ‘interpretation’ in Victoria was a small yellow sign asking tractor drivers to keep off the grass. It’s no surprise that we avoided the edges and snapped plants and landscapes instead. There were too few ‘cues to care’ to poke a lens at. We can’t use that excuse any more. In recent decades, grassland conservationists have made many fantastic wins (and suffered many losses). We have fewer remnants now, but more patches are managed for conservation than ever before. The best remnants provide stellar examples for a new generation of grassland guides, the first of which is about to hit the shelves. 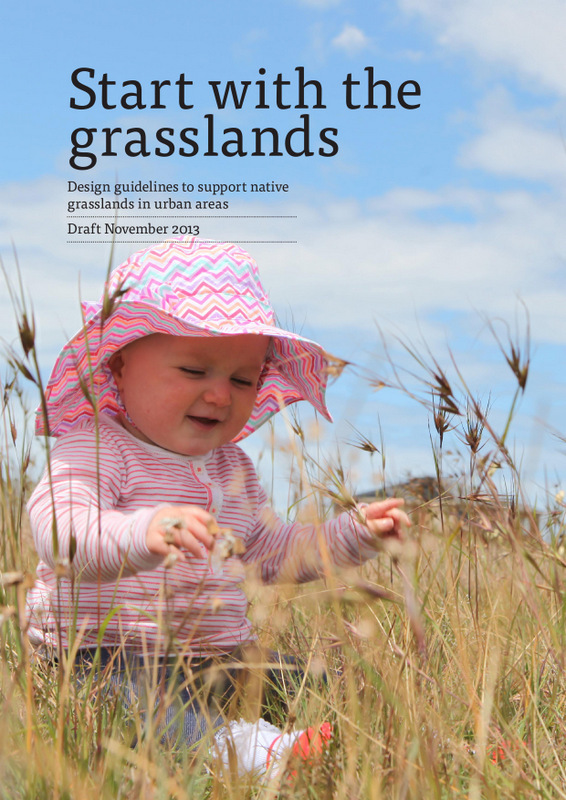 Start with the Grasslands: Design Guidelines to Support Native Grasslands in Urban Areas is a wonderful book written by Adrian Marshall and published by the Victorian National Parks Association. The VNPA are seeking feedback on the draft, so please download it (for free) and enjoy it. In my view Start with the Grasslands is the most innovative and ground-breaking book on urban grassland conservation ever produced in Australia. Most of the content is relevant to any fragmented ecosystem, so if you live near a remnant forest, salt-marsh or heathland, check it out. If you work in conservation planning, you’ll enjoy it and learn something new, no matter where you live. A new sign of intention to care. In 96 colorful pages, Adrian Marshall describes lots of ways to conserve and improve grasslands in urban areas, and to maximize the environmental and social benefits that remnants provide. With over 100 color pictures, the book showcases many examples of great conservation design. The book is structured around seven principles: (1) start with the grasslands (from the earliest stage of planning), (2) collaborate, (3) integrate, protect, connect, (4) design for maintenance, (5) communicate, (6) let people in, and (7) provide cues to care. 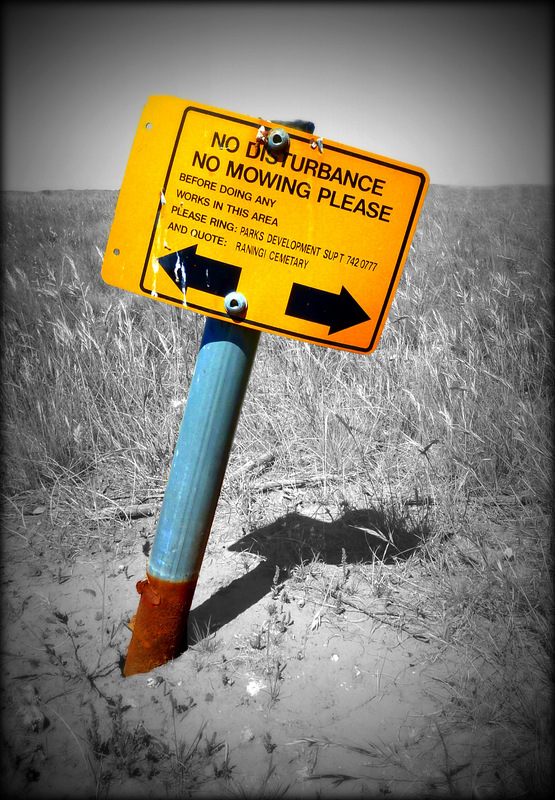 Start with the Grasslands reverses the unwritten code of earlier grassland books. It focuses directly on the points of contact between people and ecosystems: on edges, patches, paths and planning. In doing so, it demonstrates how good design can improve nature conservation and human interactions with nature. If you want valuable information on design and planning, or just want to spend a leisurely hour gazing at beautiful pictures, it’s a fantastic publication. And if you do have a terrible garden, you’ll see how to improve it. Focus on the packaging, not just the goodies within. Beautifully designed ‘cues to care’ at Aurora grassland in Epping. One of the inspirational photos in Start with the Grasslands by Adrian Marshall. Photo © James Newman, courtesy MDG Landscape Architects. Many thanks to Adrian Marshall, Dave Kendal and Tim Barlow for feedback which improved the blog, and to James Newman for allowing me to use his beautiful photo of the Aurora grassland. Marshall, A. (2013). 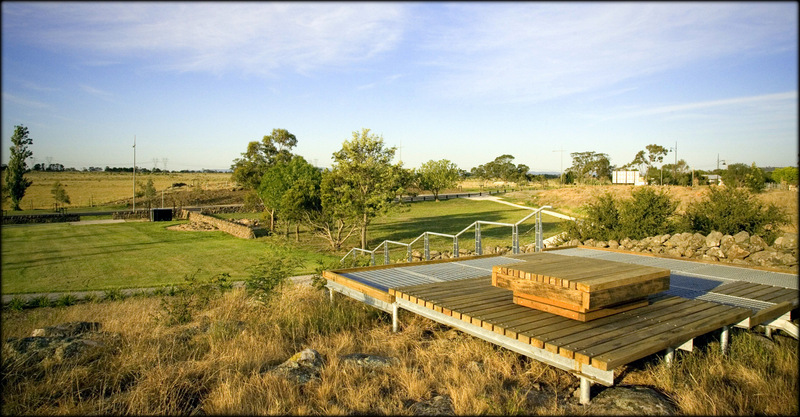 Start with the grasslands: design guidelines to support native grasslands in urban areas. Final draft. Victorian National Parks Association, Melbourne. [The free book can be downloaded from this link]. Nassauer, J.I. (1995). Messy ecosystems, orderly frames. Landscape Journal 1, 161-170. [The full paper can be downloaded from this link]. The reason I was thinking KISS was actually to limit my own tendency to digress from the import of your article which, as usual, was more than succinct. Sorry about the confusion there. Great blog, Ian – thank you. A lovely – and thought provoking – way to start my Sunday (and fitting, as I’ve just spent an hour in our VERY messy garden…!). Great food for thought Ian! I wholeheartedly agree with the ideas of Joan Nassauer and your thoughts in this blog. Remember the bad reputation that native gardens in the 1970s got because they were “too messy”? I reckon social acceptance through cues of care is going to be increasingly important for good environmental outcomes, whether it is in the front yard, back paddock or public park. Thanks for your great blogs. Yet another thought provoking blog Ian, and one I can really relate to as my suburban front yard – 2 squares of former Buffalo lawn with perimeter edged garden of (my grandmothers) Roses and European annuals – is now a bit of a mini grassy woodland. The front street verge – a true nature strip – has strips and patches of native grasses and herbaceous natives, with clear defined edges with the remaining short Buffalo. Here I particularly, annually cut back in a strategic way the Themeda and other native grasses, and some herbs. Always full and clean bird baths, garden art, arranged pieces of stone also help to suggest things are deliberate, cared for and managed in the front yard, but I still think my immediate street neighbours who are of Mediterranean and Asian backgrounds and elderly Ango-Celtic , will think it messy and uncared for. But I have had my heart sing with a few random encounters from people walking past, and one second generation young neighbour of Chinese heritage who came over to tell me how much she loved my garden. The most recent passer by, walking her Husky dog early one hot day (yet another) this week while I was out doing a bit of strategic watering, told me she “got it”. She said it was “really natural”, and the shade so welcome in an otherwise relentlessly sunny street. So instead of anticipating and somewhat defensively saying “you probably think this is messy, but….”, I’m going to leap in with how “natural” it all is. “All natural”, and other similar catch phrases often help sell packaged and unpackaged products, often at inflated prices in all sorts of areas, so maybe it’s not a bad idea to take a leaf out of the advertisers’ books (or the digital equivalent), in trying to sell my particular “package”. But then again, I guess that won’t wash with those who believe nature is just too scary. And I really agree with your description of the selective, jump from the landscape to the plant scale level, and from prior job experiences, the challenges of “presenting” smallish grassy remnants to the neat and tidy brigade. Will definitely download the the VNPA booklet. Sounds terrific. Hi Ian, I spend quite a bit of time in grassland remnants that are the last refuge of some precious plants, and unfortunately in this area the packaging is woeful. No fencing, dilapidated signage if still standing or sometimes none at all, and treated with ignore by locals. Rubbish dumped, trail bikes, etc. etc. Mainly due imho to severe lack of staff and resources in the powers that be. If only the ptb could read your blog and be inspired. I usually wholeheartedly agree with Ian on this terrific site but must object to the comment about botanists/ecologists and their gardens. Among my mates here in Canberra there are some seriously good gardens managed by people with a very good background in biology! Some of them are mixed “native gardens” and veggies but still very good in both design and maintenance. I find that these people, like myself, love “fiddling at the micro-scale” with native plants. For example in my front nature strip I have been trialling 6 spp of native grasses of the region for some years. I can believe it gives the ACT urban managers, and perhaps even my neighbours, the heeby-jeebies, because it looks a tad messy most of the time, but I would love to establish, and even encourage neighbours to begin to use the wonderful native spp of our region as suggested >100 years ago by the first horticultural manager of the ACT, Charles Weston; he forecast their utility partly because he rightly said we will not be able to water lawns!!! I discovered Joan Nassauer’s work while I was working on my PhD. She is the editor of a wonderful book called “Placing Nature: Culture and Landscape Ecology”. Well worth a read. Cultural norms that make, for instance, water hungry lawns the most acceptable element of yard landscaping, have a huge influence on how both agricultural and urban areas look. Your blogs are wonderful. I have been sharing them with Murrumbidgee Landcare’s facebook page. Not sure that will get you a wider audience but you should have one. Thanks very much for your thought provoking article. I’m a bit of a plant nut so I love the close ups of native plants and then the context of where they fit in the wide, open spaces of grasslands pictured in books and guides. I hadn’t really thought about how we package areas to enhance conservation. I guess I’m a bit torn because of the role that edges play in negatively affecting the remnant in question. If we ‘pretty up’ the edges (mowing, fencing, spraying etc.) to make it inviting for people, could we inadvertently encroach on and lose more and more of the native remnant? At Trees For Life (SA) we use minimal disturbance principles wherever possible and work from the ‘best bush’ out, rather than tinker away at the weediest sites, which are usually around the edges. But I can see that trying to reduce threats coming in through interpretative signage, clear access and paths are important. In my Bush For Life site I decided to have a go at slashing then spraying weedy perennial grasses at the entrance to the site, mainly to practice my skills and see whether the weed burden decreased. People walking through the reserve commented that it was good to see that the bush was being looked after. I’m not sure whether that is a good thing or whether it is just because the work was visible that it was appreciated (most of the work happens off the beaten track and is not often accessed by the public). Or maybe it is a lack of understanding of what ‘bush regeneration’ entails? So, yes, I agree that it is important to show the public that a place is being cared for and maybe there is a trade-off between work in the best bush and work around the edges which may enthuse and engage other people to care and perhaps adopt their own bit of bush. Our environment would be lost without the fantastic work of volunteers! When I moved into my house I converted the front yard to 2 segments, one native garden, one English Cottage Garden. A cobblestone path meandered between high shrubs and trees, making garden “rooms”, where the next “room” was not visible until you went through the “doorway”. I got the idea of garden “rooms” from a non-native garden design book. Maybe we need to use the concept, at least in urban areas. A different topic. We have National Tree Day. Why don’t we have National Grassland Day and National Heathland Day? Just came across your blog after reading an edited version of this article in the latest VNPA Parkwatch. This article struck a chord with me because of my involvement with a small local reserve, the Meredith Police Paddock. The reserve is one of many managed by the Ballarat Environment Network (BEN; http://bird.net.au/bird/index.php?title=BEN_Biodiversity_Reserves). Their reserves have an average size of 9 ha, so there’s a high ratio of edge to total reserve (small picture, big frame?). BEN’s goal is to manage the reserves for biodiversity, but aim to accommodate the visiting public and also attempt to get neighbouring properties and locals involved, so your concept of “packaging” could be very relevant. However, we will always have the delicate balancing act of protecting (and hopefully improving) biodiversity in the face of demands for better public facilities (seats, paths, being able to walk the dog, etc).